Today's defence related news includes coverage on a Barclays report, which surveys military spouses on the career barriers they feel they face, as a result of their partner's service. In The Telegraph (p2), the paper carries a short piece on the report, leading on the claim that military spouses believe there is an underlying bias against them when applying for employment. The research by Barclays goes on to suggest that 20% of spouses feel they face discrimination, and that a third have had to either leave a job or reduce their hours, due to their partner’s service. Service families are a vital part of the Armed Forces community and we encourage companies to support the careers of military partners through the Armed Forces Covenant. We have announced a new fund to step up access to vocational training and career development for military partners, and we’ve recently launched a review into the support for service families, to ensure they are not disadvantaged by their loved ones’ service. 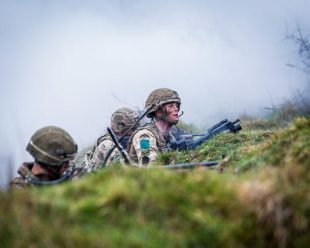 Paratroopers are on a live fire battle camp on the wintry and windswept STANTA training area in Norfolk.